The ultimate combination for the self-defense minded shooter that wants training time along with rounds for a concealed carry 1911 or other pistol. 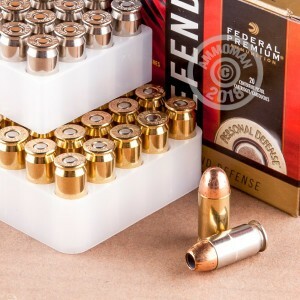 This package from Federal offers two types of .45 ACP ammunition with a great choice for each purpose. First, you’ll get 100 rounds of Federal’s American Eagle .45 ACP ammo. These rounds are 230 grain and full metal jacket (FMJ). Ideal for range training, Federal is notorious for reliable rounds that can help you get the most of your range time without the frustration brought on by extraction or loading issues. 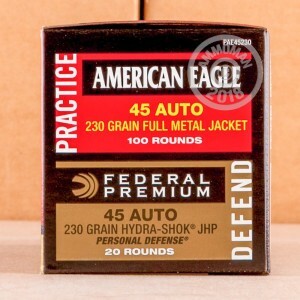 On top of that, you’ll also get 20 rounds of Federal Premium’s Hydra-Shok jacketed hollow point (JHP) ammo. These rounds are also 230 grain and are designed to be very close ballistically to the FMJ rounds. That means the better you get with the FMJ rounds on the range, the more ready you’ll be to fire the Hydra-Shok ammo if you ever need to in an emergency. Both varieties of ammunition are boxer primed and come with brand new, never fired brass cases. If you’ve never heard of Federal, it won’t take much research to find out American recreational shooters love their products. One of the largest ammunition manufacturers in the world, Federal is owned by ATK and is a part of ATK’s Sporting Group. This is the same company that operates and sells ammo under the Speer, CCI, and Blazer Brass brand names. These rounds will arrive at your door in one connected package that can break apart into the practice ammo and the defense ammo.